Here is a simple command line tip for moving a mysql database from one server to another. gzip -c | ssh user@remotehost "gunzip -c > mysql  [mysql_options]"
GO language promoted by google is a new system programming language said to be expressive, concurrent, garbage-collected. The language is still very young and there is no ready made package available for ubuntu. You can install it and try out the features from the version control repository of go . Let us see how you can do this. I did it on ubuntu 9.04. 1) Install Pre-requisites on ubuntu. You need gcc and some supporting software like bison to compile go. Install the following. $ sudo apt-get install bison gcc libc6-dev ed. The go repository uses mercurial version controls system . Install mercurial with the following command. 2 Set up the environment variables. named go in your home directory. Now create another direcory inside go . The above directory will contain your go compiler. Next, you have to set u several variables. Update your PATH variable . Check the environment variables with. It created /home/fermi/go/hg and downloaded several files to it. To build the Go distribution run. Now let us write a hello world program and test it. The above command produced and intermediate file hello.8. Next you have to link it. The executable is placed as 8.out. Finally run the executable. Byobu is a Japanese term for decorative screens . A Japanese byobu screen looks as below. You can achieve similar decorative effects on your gnome terminal or xterm , or Konsole with Byobu software available from ubuntu launchpad. Infact, the new ubuntu 9.10 ships it by default. 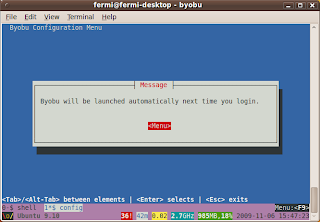 On earlier versions of ubuntu you can install byobu from the PPA here. your terminal will immediately change to the following screen. The bottom line on the above picture indicates the present status of your system. It displays several useful parameters. 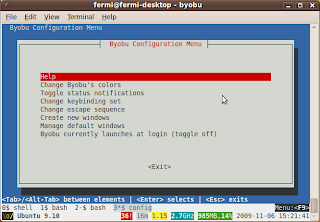 Byobu can be customised to display several other informatiin. Most of the settings of byobu are stored in a hidden directory named .byobu under your home folder. Most ot these settings can be modified from byobu itself. For customising byubu, press F9 . You will get the following screen. 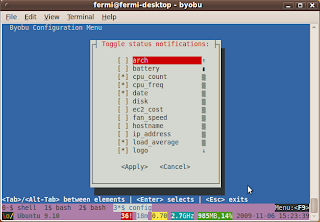 You can change the look and feel of your terminal as shown in the screen-shots below. For me the status notifications on the last line is very useful For adding additional parameters Press F9 and select status notifications , you will get the following screens. Choose whatever parameter you want to display as your default status line. 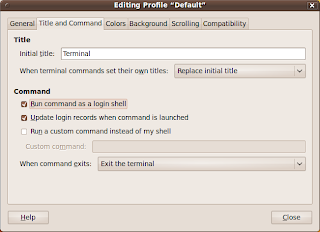 Now click on edit->> Profile Preferences-> Title and Command on your gnome-terminal and tick Run command as login shell. 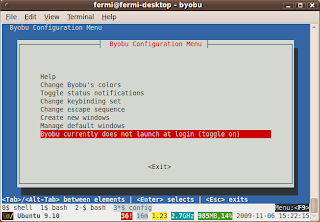 Byobu will be launched automatically next time when you start a terminal. 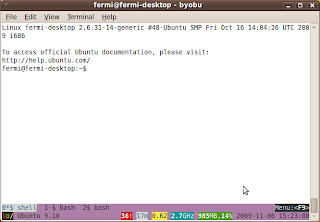 My colleague and fellow blogger Shibu Varkala has remastered the new ubuntu karmic koala . He has written a small write up. Please read it here.